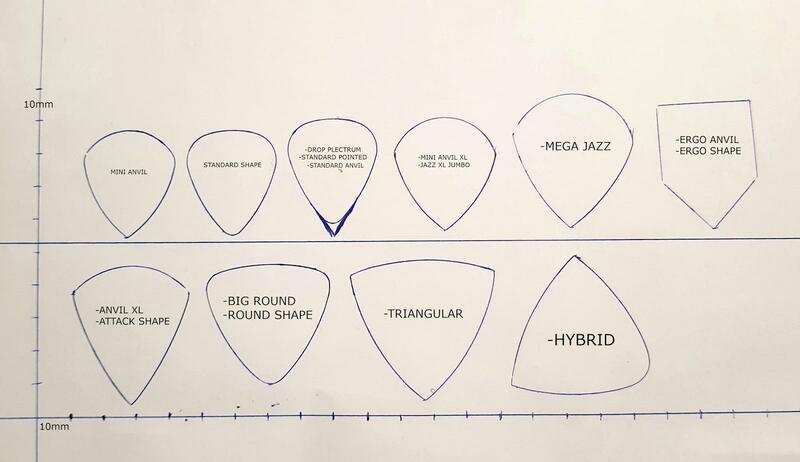 Here is a guidline to the various plectrum shapes you will find on this website, the 'drop' outline is based on a standard pick, the drop is typically approx 8-9mm thick in its center unless specified in the description. The ANVIL plectrums are approx 10mm thick unless specified in descriptions. All the picks I build are listed on this website, I do not build 'made to measure' plectrums, the flat 'Green Alien HufGlow' and 'Acrylic' picks are 3mm thick, the 'Aqua Blue HufGlow' is 5mm thick. Here is a list of materials I am currently using or have been using in the past. It is almost impossible to recommend a material considering that we are all unique, have very different playing techniques and ways of using a pick, this really comes down to personal preference and experimenting, my plectrums are not bound to a specific music style. The price of a plectrum is based on the material cost, time and labour, the more expensive, the more durable. Economy of motion + more playing strength = less playing effort! My plectrums are much thicker than the norm. The idea is to minimise movement and increase the guitarist’s hand strength. Less effort is required to play, which is a relief to the player. As a result, he will have less cramping and tenseness, which is very useful for guitarists suffering from osteoarthritis, tendinitis or other muscular problems. Naturally, this is also very interesting for the adventurous guitarist who has none of these problems, because this bio-mechanical phenomenon can help him obtain more precision, strength and speed too!